On January 12, 2016 President Obama delivered his final State of the Union speech and specifically mentioned the rising problem of prescription drug and heroin abuse. Earlier this month, AL.com published a call the President made to Alabama concerning this epidemic and the toll it’s taking on our state. He went on to explain that none of us are immune from this becoming part of our lives. It does not matter what profession you are in, what area of town you reside, or how much money you have, drugs do not respect socio-economic bounds and can affect all people in all places. This is not about a specific political party or an agenda; this is about real people that are struggling to hang on to their lives before losing it to drug addiction. Regardless of your opinion on the President and his politics, the fact that our state specifically received his attention regarding this issue speaks to the significance of the epidemic we are facing. This is an issue we can all agree on. The people around us that are succumbing to addiction are moms and dads, sons and daughters, and as Jesus taught us, they’re our neighbors. They aren’t to be thrown on a trash-heap of people that most of society sees as worthless or unsalvageable. However, we know that loving them well can be extremely difficult. If you ever have any questions about an issues you or your family is facing or about how we might be able to help, please don’t hesitate to reach out to us: Contact Urban Purpose. Although Birmingham is labeled the Most Bible-Minded City in America (http://cities.barna.org/2015-bible-minded-cities/) the fact is that drug use is still something we face on a daily basis. Surprisingly enough, many times it’s going on in our own neighborhoods. This past weekend an article was written in the Vestavia Voice about the rising of heroin death rates in 2014. This is an ongoing issue that boils down to one thing: sin. Please be in prayer for the people in our city that are struggling with this sort of addiction. We also ask that you pray for us; that the Lord gives us wisdom as we deal with addiction issues such as this on a daily basis. The good news is that people are beginning to recognize that this is something that is right underneath our noses. Now the goal is to learn how to walk beside someone as they deal with an addiction issue while loving them and ultimately pointing them to Jesus. I looked into my hand and dropped the item on the ground and as I lifted my foot to crush it her crying became uncontrollable. It’s obvious that this item had great value to her. It gave her, in her mind, some kind of peace. It allowed her to not feel the deep-seeded problems in her life that were causing her so much pain. 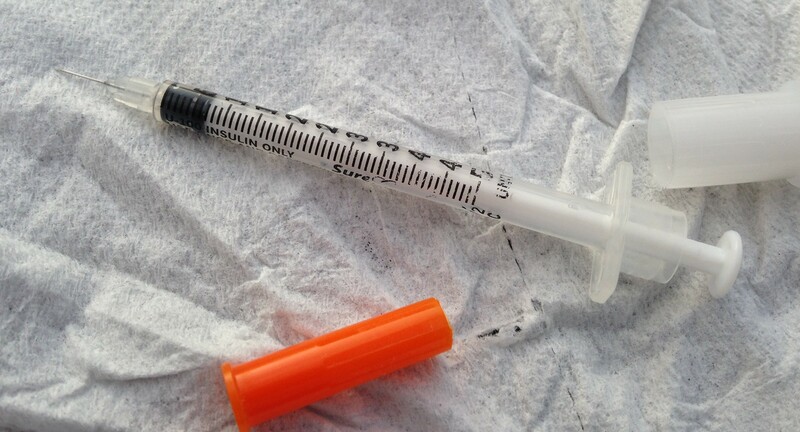 Her item was an empty syringe; she used it to shoot heroin. This probably seems pretty crazy and extreme to most of us. I know it seemed that way to me, but the more I thought about it, the more it hit me. We all struggle. We all have that “thing” in our life. What’s that thing that’s not good for you that causes you concern or maybe even brings you great pain to even think about parting with? It’s really as simple as this: we hold onto the sinful things in our life thinking that we gain some kind of comfort or peace from the very thing that is actually destroying us. A lot of the times we even like it, which makes it even more difficult to release. When we first sin it doesn’t seem that bad. It doesn’t see like that big of a deal. But the devil can take our little dabble in sinful things and grow a full-blown addiction or worse. Sin at any level destroys us. It separates us from our God. And we simply can’t afford that separation. And that separation will never lead to peace. As we move to wrap up the series Heroin on the Rise, we want to offer a different, more personal perspective on the effects of heroin. Today’s post is the second part of an article written by the mother of one of our clients who battles a heroin addiction. We hope that her insight will be eye opening and challenging as together we learn more about heroin and the great toll that it takes. Miss part 1 of this article? “We tried to deal with this alone for many years because of the shame and embarrassment. What would people think about our family? What kind of parents are we? What kind of Mother am I? I pray, but I wanted God to swoop in and do what I needed him to do. I had it all worked out, I just needed a little help from Him. You see, I am a fixer, a control freak so to speak. There isn’t much I can’t do if I put my mind to it. But this, this was way out of my league. Once I realized that I couldn’t fix “this,” and I had to surrender total control to my Lord, things began to change. We opened up to our Lifegroup at church. What a relief that we didn’t have to carry this burden by ourselves. I shared with some of my closet friends. They didn’t think we were freaks or had two heads. They prayed and they cried with us. I felt God’s loving arms so totally around us and knew He was there. Once I finally understood that this was a battle that our son was going to have to fight, and that I couldn’t “fix” it for him, I felt peace. My heart has been broken into a million pieces for him. I am his Mother, after all. I pray for him constantly that he will have the strength to fight Satan and will surrender this demon to his Heavenly Father. He is in a long-term Christian drug rehabilitation center. He has had some ups and downs, but that is the life of an addict. I don’t think about tomorrow for him or the next week because it’s just too overwhelming. I just pray each day that he will get through it. Heroin on the Rise: What is it and why is it on the comeback? A full-blown addiction to heroin isn’t something that develops overnight. Heroin is rarely, if ever, the first drug someone uses. Normally, there’s a progression of drug use and abuse that occurs in a person’s life that leads them down the path to a heroin addiction. According to teens.drugabuse.gov, the most commonly abused drugs amongst teenagers are tobacco, alcohol, and marijuana. After that, the most abused drugs are prescription painkillers. And this is where the slippery slope towards heroin use begins. According to the website mentioned above, 2.8% of young people between the ages of 12-17 reported abusing prescription drugs in the past month. In a survey of high school seniors, 14.8% reported prescription drug abuse at some time in the past year. Many of the prescription drugs that are being abused are in the opioid family. Almost 50% of high school seniors have said that opioid pills would be easy to find. Herein lies one of the biggest parts of the problem. These are drugs that teenagers can find in their parents’, grandparents’, or friends’ medicine cabinets. They don’t have to go into shady parts of town to meet a drug dealer. They can grab them at home or buy them from a friend at school or down the street. After the fun or “newness” of taking the pills wears off, a common next step is to crush and snort the pills. This often gives the user a different and more intense high. Opioids are effective at impacting our perception of pain and pleasure. They attach to opioid receptors in our body and block pain and, when abused, give the user a euphoric rush. However, the negative side-affects of abuse show up relatively quickly and include drowsiness, constipation, and respiratory problems. Heroin is a drug that is made from morphine, which means it is an opioid drug. There are two main reasons users “graduate” from opioid pills to heroin use: it provides a more intense high for a cheaper price. Heroin can be found in a white/brownish powder form or in a black, tar like substance. The powder is either snorted or mixed with water and injected through a needle (which commonly exposes the user to Hepatitis C and HIV). The “black tar heroin” is smoked. Over time, a serious physical dependency on the drug is developed. If a person tries to quit “cold turkey” or is unable to find/afford their next hit, common symptoms usually include diarrhea, vomiting, muscle and bone pain, and insomnia. This is part of what makes it so difficult for heroin addicts to quit and also makes them so rabid in securing their next hit. Another serious danger is the risk of overdose. Most drugs that are bought on the street are “cut” with other substances. The purity of the heroin someone buys on the street may vary from bag to bag. So, a person may think they’re injecting the same amount they always use, when it reality it is much more potent and their body can’t handle it. For those that have never battled addiction, it’s difficult to understand the hold drugs in general, and heroin in particular, can have on someone. It’s easy to say or think, “Hey idiot, why don’t you just quit.” If the solution were that simple, we wouldn’t be facing this epidemic. For many users, it’s so much more than just getting high. It’s about running from the pain, trauma, and abuse they’ve experienced for much of their lives. If you’re constantly tormented by your past and your emotions and you’ve never developed the coping skills to deal with the issues, a twelve hour reprieve from the pain sounds amazing, consequences be damned.